We have always been very happy with Leila’s daycare, and now Thea’s daycare too. The staff are very friendly and you can tell when we drop the girls off, that the kids are excited to be there (most days). In the wake of the tragedy in Haiti, I was given another reason to feel good about Love a lot. Leila came home with a note that I took a picture of to attach here. 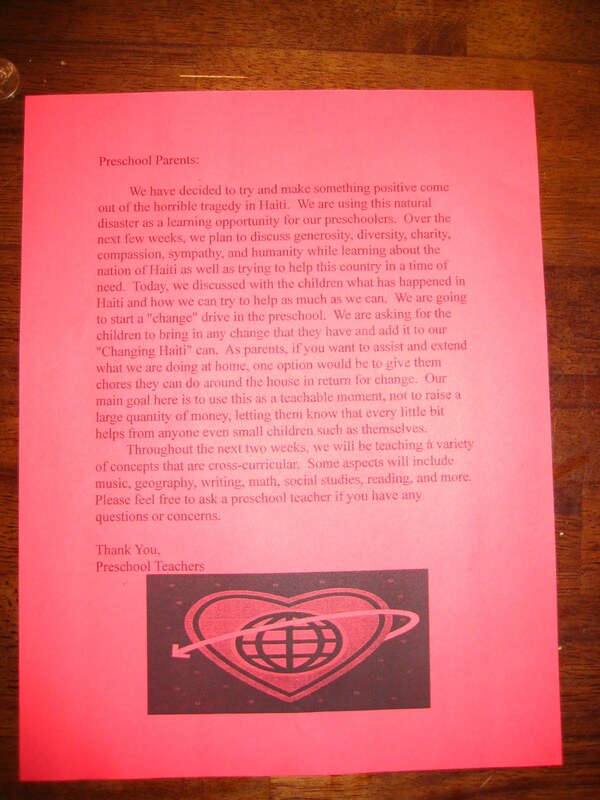 I am not sure how easy it is to read, but the gist of it is that many kids in the pre-school had asked questions about Haiti and about Earthquakes, so the staff decided to switch up the lesson plans and do a 2 week unit on Haiti, and other countries and cultures of the Caribbean. As part of this effort, the kids were encouraged to donate change to the families in Haiti who were in need. LOVE this idea. 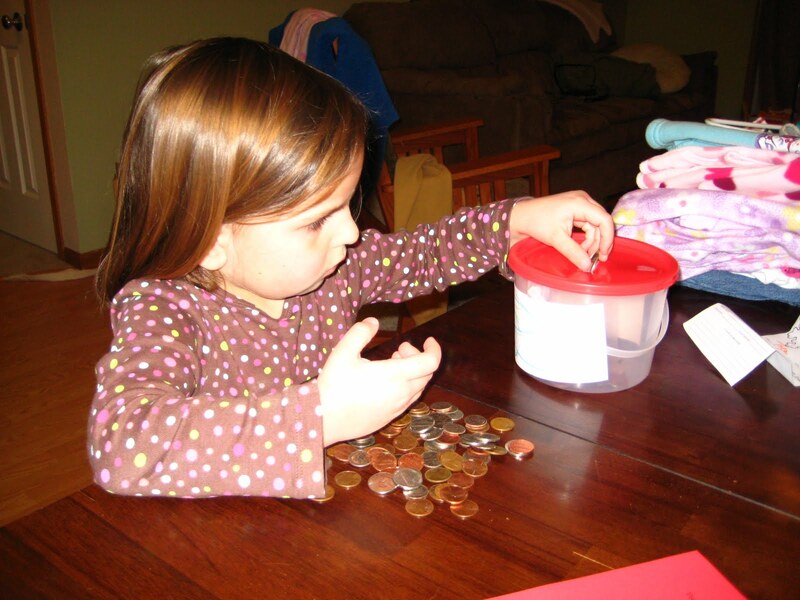 So we talked about it with Leila and she chose to give some of the money from her piggie bank, and over the last two weeks has been doing some little chores to earn more change to donate. I plan to keep this up, since we never got going on our Pennies for Peace, and continue to encourage Leila to give to others. I am so proud of my girl, and proud of the school we chose for her as well. She was so proud to bring in her bucket to add to the pre-school fund, and I am proud of her for giving, even though she doesn’t really understand the value of money, she does really like it, so it means a lot that she would give it away. >Good job Leila! Very thrilled to see her thinking of others at such a young age. It's never too early to learn empathy for our fellow human beings. You must be so proud Tricia!